This article has been viewed 8387 times. This is my personal experience of dealing with canine hip dysplasia. The symptoms, the physical strains and the emotional rollercoaster. If you have experienced it, my heart goes out to you and your animal, you are not alone. As avid animal lovers, we couldn’t wait for the day we moved out of our rented accommodation and bought our own house – this meant, a dog, at last! 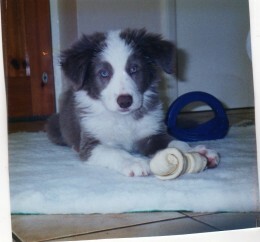 That same year we were owners of the most beautiful longhaired, bright blue eyed, silver fawn border collie, we named Holly. Holly is not the usual skittish and very often, snappy border collie, she is extremely well natured, very loving and loyal and, as you would expect from the breed, intelligent. We devoted time to train Holly in all lines of obedience and agility, she was exceptional and we took the decision that we would like to breed from her once to keep her bloodline going. Years later and many rosettes later, Holly was at the peak of her agility career. Then my Father died, which was a big blow and we took a few months out of training. Then 3 months later Holly started to limp. There was no real pattern to it, she would get up in the morning stiff and limping but then after a while would be ok. We take our dog’s health and welfare very seriously. Upon closer examination of pad, paw and leg, there was nothing obvious. Thinking it may be a pulled muscle, as is so often with energetic dogs, rest was the order of the day. But, whilst out on walks, she would fall behind, she also developed a slight limp during long walks - now it was time to visit the Vet. To cut a very long story short, we paid numerous visits to our Vet, he diagnosed many things from an infection due to a thorn, to thin pads. We were given different painkillers and potions that made no difference. After the fourth visit we begged him to x-ray her but his opinion was that an x-ray was not necessary. After three months of getting nowhere, we took a second opinion. This is something I would stress, if the route of the problem is not found or you feel unhappy with the diagnosis, get a second opinion – time may be of essence with many conditions! The second Vet diagnosed her immediately by simple examination and watching her gait (the way she walks, by swinging out her leg and ‘bunny hopping’). An x-ray confirmed that, at the age of 3, Holly had a severe case of hip dysplasia in both hips and osteoarthritis in the right. You are either a dog lover or not. We have no children and Holly is our world, she is no ordinary dog. We were devastated, more upset than we ever imagined we would be, so close to my Father’s passing too. This is a terrible disease in any dog, but a border collie who is designed to run 100 miles a day and is one of the most intelligent breeds, it’s just heart breaking. Obviously her agility career was over. She would have to be spayed because we couldn’t risk breeding her. She would now need five short ten minute walks a day, a course of hydrotherapy, a controlled diet, a program of painkillers to manage the varying day to day pain, mental stimulation to take the place of her physical activities, and so it goes on – but not only all that, it will ultimately shorten her life as her joints will give way before her organs. How do you cope with that, saying goodbye to a much-loved pet that is equivalent to a ten-year-old daughter, when she is still mentally and physically active apart from her hips! We spent day after day researching the condition. Experts said because she was coping, an operation is too big to risk. So what do you? Wait for it to get really bad when she is too old to have the operation? They said the biggest risk is from infection. So we researched the leading and proven medicines and natural alternatives. It took a year or so to really get a program of medicine, diet and exercise running smoothly. After all she has been through, five years later we found a lump on her side. The vet was optimistic that is was benign but to be safe, the lump was removed and sent for testing. Another blow came when the Vet revealed it was a grade 2 Mast Cell tumour, the most aggressive form of cancerous tumours that spread very quickly and have a habit of returning. The Vet was concerned that not enough tissue had been taken away around the tumour and, again, to be safe, Holly was operated on and more tissue removed. I think the feeling of helplessness is the worst, not being able to communicate. However, we have a very strong bond with Holly and can second-guess her mood, pain and sadness reasonably well now, even though she tries to hide her pain - especially if there is a walk in the offing. Eight years on and we have been continually developing Holly's medicine, diet and exercise program but her painkillers have been doubled. However, the end of 2010, Holly took a very worrying turn for the worst and we were dreading it may be that time. Holly is only 10 and we weren’t prepared to accept this, so more research was needed. Holly’s body is now struggling to reproduce the synovial fluid and joint tissue that is needed to protect her joint, it happens to all animals and humans at a certain time in life. The leading veterinary product didn’t seem to be helping any more and this was also due to the fact that the powder capsules were dissipating and leaving her body too quickly. This is when we discovered a 100% natural aloe vera gel that contains glucosamine, MSM and chondroitin – these things she was already taking but we were advised that the consistency of the aloe vera would hold the medicines in the body for longer to enable it to reproduce those vital properties much needed in her hip joints. Not only that, 100% pure aloe vera has powerful natural anti-inflammatory and painkilling properties, amongst 75 other nutrients that combine synergistically to provide a cocktail of health benefits. We were told to be prepared that it may take up to 3 months before we would see any effect but, within 5 days Holly was moving her hip just that little bit easier, she has bundles of energy and a sparkle of happiness in her eyes that had started to diminish over the last few months. Nearly a year on and she is doing great, obviously she will never be cured and her condition will get worse but the aloe vera drink, along side her regular programme of exercise, hydrotherapy, painkillers and herbal medicines, is giving her the capability of being able to enjoy a much better quality of life and hopefully for much longer! www.PurelyNature.co.uk - Natural health, fitness, beauty & animal health products. As well as the Aloe Vera Gel containing glucosamine, MSM & chondroitin, there is also an MSM cream for instant relief, HA and Omega 3 supplements which help replace vital joint fluid & cartilage tissues. Diet - keep the weight as low as possible. Find the right food that best suits your animal, a good quality, low fat food with added joint care. Use pieces of raw carrot, apple, raw cabbage etc for treats - raw veg also excellent for healthy teeth. Exercise - regular, short exercise, five 10-15 minute walks a day if possible, on a soft surface like grass. Medicines - painkillers are unavoidable I'm afraid especially in severe cases, make your animal comfortable to enable regular exercise to maintain muscle mass. FInd a Vet you have total confidence in, if in doubt - get a second opinion! Complementary medicine - there are a lot of effective natural supplements out there that will provide help to replace the essential joint tissue and fluid; HA, Cod Liver Oil, Omega 3, Glucosamine, MSM, Chondroitin etc, research and look at factual results. Hydrotherapy - a valuable non-weight bearing form of exercise I would strongly recommend to sustain healthy muscle growth and fitness, and general wellbeing. Mental stimulation - this is something people often overlook. As with humans, when animals are unwell they feel down and depressed. We have a constant battle keeping Holly's mind active due to her high level of intelligence and physical capabilities. Games that employ intellect will help keep your animal happy and positive; hide and seek, hide the treat, gentle agility game like low tunnels, fetching named toys, heel work and there are many games available on the market today full of ideas. Understanding your animal - the biggest problem is that our animals cannot communicate with us. I am very lucky, I have a very close relationship with Holly and can almost tell what she is thinking. You will need to be sensitive to your dog's body language; does that mean they are in pain; have they had enough, are they unhappy, are they frightened? Weather - don't let your animal get too wet or too hot. The osteoarthritis will become worse during damp cold weather and the joint will swell and become painful in hot weather. Biography: Away from work Marie's passion for animal welfare and the great outdoors is reflected in her interests. These include walking Yoga wildlife watching camping growing organic produce and anything connected to border collies - particularly her own!